The President of India, Shri Pranab Mukherjee received today (April 7, 2016) the first copy of a book ‘Statement of Indian Law: Supreme Court through its Constitution Bench Decisions since 1950’ written by Shri Govind Goel, Advocate, Supreme Court of India. 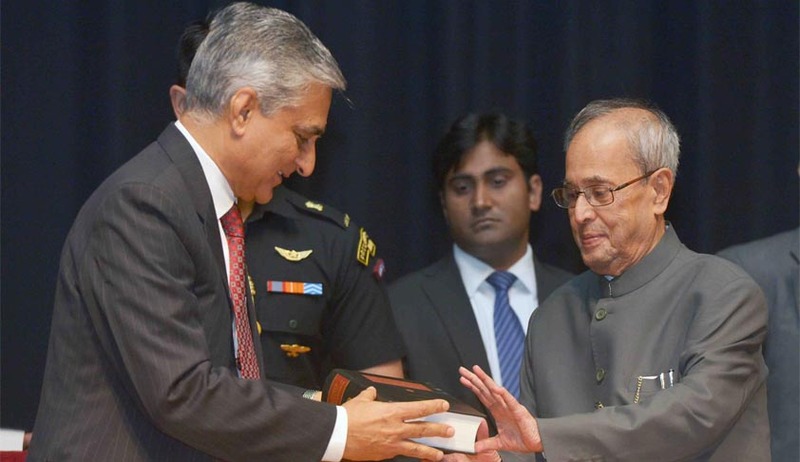 The book was released by Justice TS Thakur, Chief Justice of India at a function held at Rashtrapati Bhavan. Speaking on the occasion, the President said Constitutionalism is the primary edifice on which the Indian democracy stands. The rule of law is the hallmark of our democracy, due to which every Indian feels empowered, making him or her participate in nation-building with full vigour and enthusiasm. The President said unlike the Supreme Court of the United States, where judges are appointed for a life term by the political executive keeping in view ideological preferences, judges of the Indian Supreme Court are appointed through a non-political process uninfluenced by such considerations. As a result, the law that has emerged having been interpreted by the Constitution Bench of Indian Supreme Court navigates through diverse social, economic, political, cultural, historical and ethical moors. This has made the Constitution of India a living organic document keeping pace with the changing times. The President said Constitutional Bench decisions have exhibited a reasonable degree of durability and have left indelible footprints on the sands of time. Of the 2,296 decisions of the Constitution Bench, only about one percent have been overruled, which is considerably less than the number of constitutional amendments. Yet, there may be a possibility, and more so desirability, of revisiting the correctness or relevance of a decision as per the contemporary needs of society. The book ‘Statement of Indian Law: Supreme Court through its Constitution Bench Decisions since 1950’ is a study of all the judgments delivered by the Constitution Bench of the Supreme Court of India since 1950.